The recent arrival of cold weather and a conversation reminiscing with my mother about the strong wind wind that whipped the roof off her garden shed a few years back, reminded me of one of the Ordnance Survey Letters written by John O’Donovan in 1839 while in Co Wicklow. The letter in question refers to what was known as the ‘Night of the Big Wind’/ ‘Oiche na Gaoithe Moire’, a terrible storm that swept across Ireland on the 6th-7th January 1839. The storm cause a massive amount of damage around the country and its effects were such that the event lived in the minds of the people for decades to come. The foricity of the storm was such that it made its way into oral history of the county. Description of the Devastation caused by the ‘Night of the Big Wind’. For those of you who don’t know, the Ordnance Survey of Ireland was established in the year 1824, to undertake a townland survey of Ireland and to map the entire country at a scale of 6 inches to one mile, for the purpose of the creation of a tax system. The mapping was completed by 1842, and a full set of maps exists for each Irish county. The maps and later editions can be viewed on the Ordnance Survey of Ireland website. The Ordnance Survey Letters are manuscripts containing the surveyors’ field notes, commentaries and correspondence to the Ordnance Survey headquarters in Dublin during the mapping. John O’Donovan (1806-1861) was a historian who worked for the Ordnance Survey. He led the information collection part of the project, many of the surviving letters were complied by him. The letters are of great use to historians and archaeologist as they provide information on placenames, details on topography and often detailed description of historic sites such as castles, ringforts and churches. The letters are also interesting as they occasionally provide a ‘unique glimpse into everyday life in many parts of Ireland in the years leading up to the Great Famine’. They also occasionally give a glimpse of the day-to-day lives of the compilers and their everyday trails and tribulations. One of my favourite letters dates to January 1839 and relates to John O’Donavan’s journey from Baltinglass to Glendalough Co Wicklow and his stay at Glendalough during the ‘night of the Big Wind’. O’Donovan travelled with Thomas O’Connor who also worked for the Ordnance Survey. The letter decribes the details of the journey and the stay at Glendalough with such detail, that you almost feel you are withnessing the events unfolding. You also get a rare glimpse of the personalites of O’Donavan and his survey team. According to the letter the pair travelled first from the town of Baltinglass to Blessington and then on to Glendalough. The distance between Blessington and Glendalough was according to O’Donavan ‘only sixteen miles’ and was undertaken on foot. In modern Ireland where we all rely so heavily on cars and buses, the thoughts of walking sixteen miles seems out of the ordinary but during the nineteenth most journeys were by foot so O’Donavan and his companion were undaunted. The route from Blessington to Glendalough would have taken the pair over the mountains into the Kings River Valley through the Wicklow Gap and on to Glendalough. This route was used by pilgrims visiting Glendalough for centuries. We left Baltinglass on Friday and travelled by car to Blessington, expecting to be able to get a car thence to Glendalough: but the Hotel Keeper would not send a car thither at the usual price per mile and I was not willing to give him more. So on the next morning, which promised to produce a fine hard day; we set out for Glendalough on foot across the mountains, thinking nothing of the distance, which is only sixteen miles around the road. The initial part of the journey seems to have been quiet pleasant until the weather changed and it began to snow. We came on in very good humour for seven miles, stopping on the way to look at old churches, but when we reached the side of what they called the Cross Mountain, the day suddenly changed its aspect, the snow fell in luxuriant heavy leaves (drops) and before we reached the top of the mountain we found ourselves in the middle of a snow storm. The onset of heavy snow caused some concern for O’Donavan. Despite his companions wishes to keep going, for safety reasons he decided they should head back towards civilisation, a wise decision given the remoteness of the area they travelled through and the lack of available shelter. The pair turned back and found shelter at Charley Clarke’s public house. I stopped short and paused to consider what it was best to do. The clouds closed around us and the wind blew in a most furious manner. Here we met a countryman who told us that the distance to Glendalough was nine miles, that the road was for six miles uninhabited, and that the last flood has swept away two of the bridges. I got a good deal alarmed at finding ourselves a mile and a half into the mountain and no appearance of a cessation of the snow storm. I told O’Conor, who was determined to go on, that I would return, that I did not wish to throw away life to no purpose. I returned! (Coward) The whole side of the mountain looked like a sheet of paper horribly beautiful, but the wind was now directly in our face. From O’Donavan’s account Clarke’s inn was a bit of a dump. The room was damp and cold and if events happened today O’Donavan certainly wouldn’t have given the inn a good review on Trip adviser. We returned three and a half miles and stopped at Charley Clarke’s public house, where we got infernally bad treatment. The next morning, I felt very feverish from having slept in a damp bed in a horribly cold room. The weather seems to have improved the following day and O’Donavan ‘ resolved’ to carry on with the journey to Glendalough. Having caught a chill from the night before, he must have felt rotten as he began his journey. 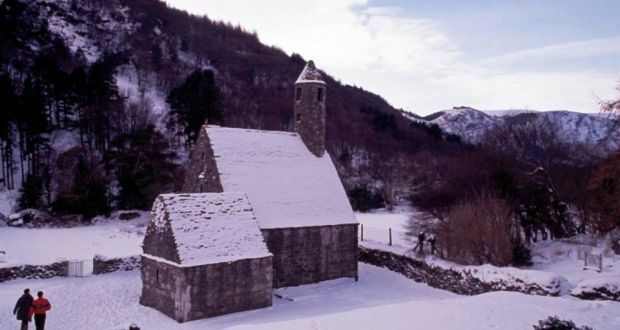 … seeing that the snow began to thaw and it being Sunday, I resolved to go on to the Churches[Glendalough]. I never felt so tired! Although the weather had improved the conditions of the journey were far from pleasant. The heavy covering of snow disguised hollows in the ground which made the terrain more difficult to navigate. Having occasionally had to worked while sick in winter on archaeological sites I can sympathise with and imagine how wretched O’Donavan felt as he set forth. Sinking thro’ the half dissolved masses of snow and occasionally down to the knees in ruts in the road, which proved exceedingly treacherous as being covered with the snow. One of my shoes gave way and I was afraid that I should be obliged to walk barefooted. We moved on, dipped into the mountain, and when we had travelled about four miles we met a curious old man of the name Tom Byrne, who came along with us. We were now within five miles of the Glen but a misty rain, truly annoying dashed constantly in our faces until we arrived at Saint Kevin’s Shrine. Horribly beautiful and truly romantic, but not sublime! 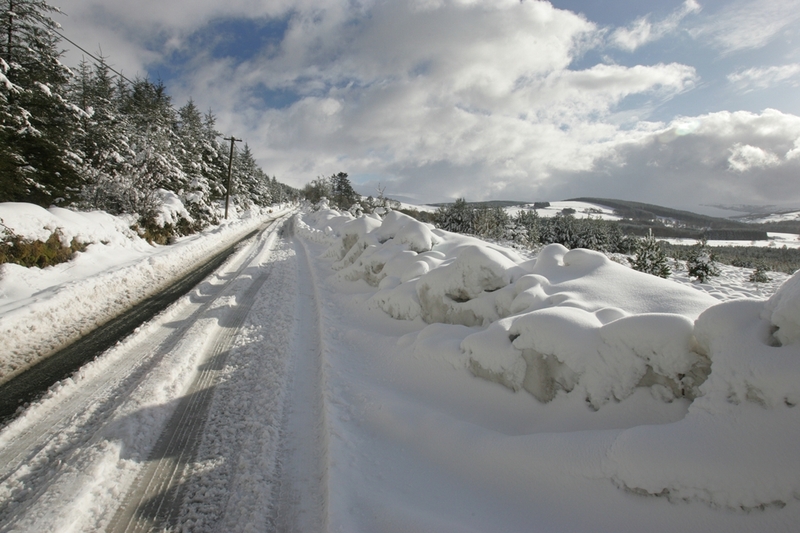 I came across this you tube video of Wicklow Mountains in the snow. Imaginine travelling on foot in these conditions. When they finally arrived at Glendalough the pair booked into the local hotel. Their feet and clothes must have been soaked, and O’Donavan purcases a pair of wool socks. Having changed clothes they headed off to explore the ruins of Glendalough, which must have been quite impressive in the snowy landscape. The ruins gave O’Donovan ‘ a deal of satisfaction’ and he must have felt the awfulness of the previous day was behind him. However ,things soon began to go down hill when they returned to the hotel later that evenining. Following a ‘bad dinner’ they retired to their beds, unaware one of the worst storms Ireland had ever seen was on its way. O’Donavan’s mind was full of work he writes that could not sleep, thinking of all he had to do and for fear of further snow. We got a very bad dinner and went to bed at half past twelve. I could not sleep but thinking of what we had to do and dreading a heavy fall of snow, which might detain us in the mountain. O’Conor fell asleep at once. Around 1 o’clock the storm hit Glendalough. At one o’clock a most tremendous hurricane commenced which rocked the house beneath us as if it were a ship! Awfully sublime! But I was much in dread that the roof would be blown off the house. O’Conor seems to have been obvious to what was going on around him and continued to sleep soundly much to O’Donavan’s annoyance. I attempted to wake O’Conor by shouting to him, but could not. The wind continued unabated. Around 2 o’clock things took a nasty turn when the window of their room blew in. With difficultly O’Donavan managed to close the shutters of the window, holding them shut with his body, only moments later for them to be blown open again by another gust of wind and O’Donavan thrown across the room with the force of the wind. About two o’clock the storm became so furious that I jumped up determined to make my way out, but I was no sooner out of bed than the window was dashed in upon the floor and after it a squall mighty as a thunderbolt! I then, fearing that the roof would be blown off at once, pushed out the shutter and closed it as soon as the direct squall had passed off and placed myself diagonally against it to prevent the next squall from getting at the roof inside, but the next blast shot me completely out of my position and forced in the shutter. Only now did O’Conor wake up!! This awoke O’Conor who was kept asleep as if by a halcyon charm! O’Donavan closed the shutters again and his companion went to seek help from the hotel staff. Eventually the ‘man of the house’ secured the window. I closed the shutter again despite of the wind and kept it closed for an hour when I was as cold as ice (being naked all the time). O’Conor went to alarm the people of the house, but he could find none of them, they being away securing (saving) their cattle in the outhouses which were much wrecked by the hurricane. The man of the house at last came up and secured the window by fixing a heavy form against it. Poor O’Donavan spent the rest of the night in the kitchen. I get the sense that the hours that followed were not any less dramatic. I then dressed myself and sat at the kitchen fire till morning. Pity I have not paper to tell the rest. The next day the damage of the storm became clear, many homes in the area were badly damaged. A tree in the Church Yard was prostrated and many cabins in the Glen much injured. The boat of the upper lake was smashed to pieces. The old people assert that this was the greatest storm that raged in the Glen these seventy years. We go on to-night to Dublin by the coach which passes here at one o’clock. O’Conor returns to Blessington to finish the barony of Lower Talbotstown. Being on a tight scheduled the pair boarded a stage coach and head on their way and so the letter ends. The letter above was taken from The Ordnance Survey Letters of Wicklow referenced below. Corlett,C. & Medlycott. J. 2000.The Ordnance Survey Letters – Wicklow. Published by Roundwood & District Historical & Folklore Society and Wicklow Archaeological Society. This entry was posted in Folk traditions, Pilgrim Road, Uncategorized and tagged Glendalough, John O'Donavan Ordnance Survey, Night of the Big Wind 1839, Ordnance Survey Letters of Wicklow, Wicklow 1839. What a great account of an extraordinary event – from Mr O’Donavan and from you – great photos too. Great post – I love the quotes from O’Donovan. I really enjoyed reading the first hand account. O Donovan was a great writer – He really brings that awful night to life. I spent a night in Glendalough in February 2016 and heard a wind throughout the night like I had never heard before. This was fun to read.